Perhaps you tend to lean toward the DIY method when it comes to your household. While that may serve you well on many household projects, there are also times when the best course of action is to call a professional—especially if that household project has anything to do with your plumbing system. Interestingly, one of the biggest misconceptions out there is that plumbing is relatively simple and safe. The reality may actually surprise you. The majority of people are simply unaware of the dangers involved in the plumbing industry, and those problems are only magnified when homeowners, completely unaware of all the possible dangers, take on their plumbing system. From lead poisoning, to burns, to eye damage and even potentially blowing up your entire home, the risk is not worth it. There is a reason why plumbers have to undergo such extensive and lengthy training. They have been well trained in navigating the dangers and know how to fix plumbing issues safely. 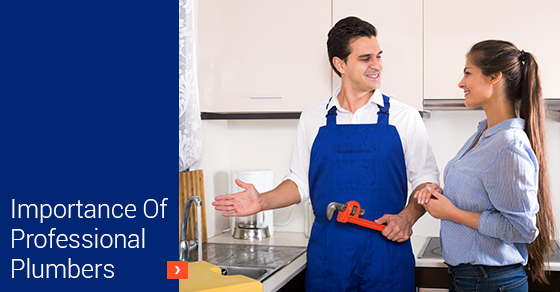 Both plumbing systems themselves and the tools used to work with them are complex. There is a lot of room for error when an untrained amateur attempts to solve a seemingly basic plumbing issue all on their own—this even applies to things like clogs. When homeowners begin inserting household tools into their plumbing system, they are going to run into even worse problems than they had to begin with. Plumbers have the training and experience to detect the underlying causes of your plumbing issues. While you may be able to fix the problem temporarily (not without risk, of course), more than likely you will not address the underlying cause, which will inevitably cost you more money at some point in the near future. Ultimately, plumbers have years of experience and know their way around plumbing systems. This means that they are going to be able to detect and solve the problem much faster than someone with much less experience. Any problems are also going to be correctly solved the first time. If you are in need of first-rate professional plumbers, contact our team of experts at Brothers Plumbing today. We are one of Toronto’s leading plumbing service providers, with over 50 years in the industry (you can’t compete with that!) and affordable rates.